Providing you with the comforts of your own home, Santos #201 is the perfect 2-bedroom, 1-bathroom upper level unit for your next getaway! Located on the popular north end of the island, this apartment has a fully-equipped kitchen that includes every amenity needed for an extended stay or a short getaway. The master bedroom and guest bedroom are each furnished with a queen size bed, while the main living area offers a queen size sleeper sofa, allowing this unit to accommodate up to 6 people comfortably. Flat screen TVs can be found in every room, and free WiFi internet is available throughout! A laundry facility is conveniently located onsite and private parking is included to ensure a hassle-free stay! Stepping outside, you can lounge on the covered deck which offers partial ocean views, or sit back and relax in the outdoor entertainment area equipped with picnic tables and BBQ grills! 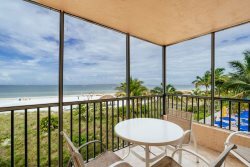 Just steps from your front door, you will find the 7-mile stretch of sugar sand beach, local shops, restaurants, a convenience store, and Crescent Park. Just a short 5-minute (0.2 mile) walk away, you will be sure to enjoy downtown Times Square, live entertainment, the famous pier, as well as numerous island activities! A beach trolley stop is also conveniently located nearby if you wish to explore further up or down island! An extra day to play—on us! Minimum stay of 4 nights required. Cannot be combined with 7-night weekly discount. Stays of 7 nights can add an 8th night for free. Offer valid from July 1 - December 22, 2018. Must call to redeem. Partial ocean views from the upper deck! 5-minute walk to downtown Times Square! Across the street from the beach!